I enjoy the dynamic environment of classes and workshops. It's a pleasure to get together with others and explore new territory in art. Spring and Summer 2019 Workshops are open for registration! I'm happy to announce that thanks to a generous donation, I am able to offer $50. materials grants to those who need them. If such a grant would help you take a workshop, please let me know and we'll arrange it. Six grants currently available. Davis is easily accessible from the Bay Area by train (Capitol Corridor), car (your car or Lyft, Uber) and from other locations by air--Sacramento Airport is a short drive away, easy access to Davis. Places to stay near the studio include Air B&Bs and small, cozy hotels. 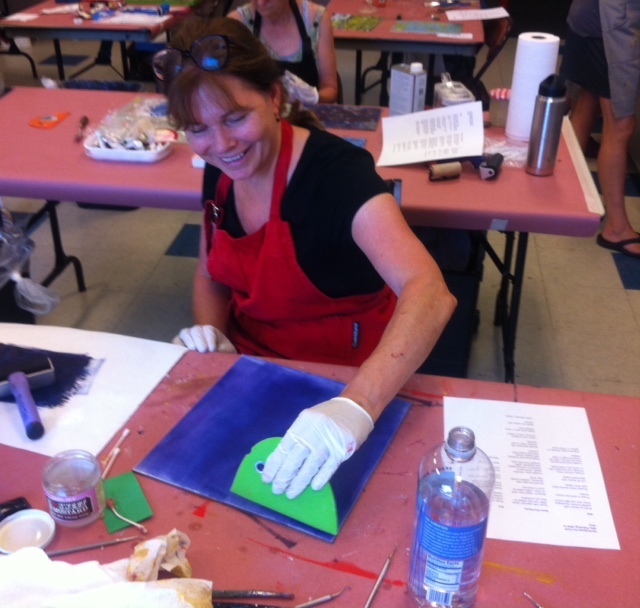 This workshop explores uses of oil paint and oil friendly media on paper and cradled board. All levels are welcome. Handprinted monotype, drawings and beautiful papers form the basis for individual abstract mixed media collaged paintings. House paint, newsprint and tissues create a base for the addition of interwoven successive layers of paper and paint. We'll use additive and subtractive techniques to design beautiful, interesting surfaces and compositions. Final layers of pigment sticks and cold wax add an additional option for creating radiant color and depth. Beautiful places add their own special energy to making artwork, while getting away from home gives you a protected art environment. 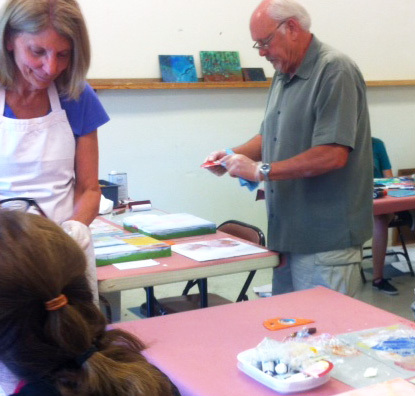 Summer-Fall 2019 workshops in Mineral Point, Wisconsin, Mendocino, California and Whidbey Island, Washington are perfect places to relax and explore new directions in art. The art school at Shake Rag Alley is located in Mineral Point, a former mining town located in the midst of rolling hills surrounded by beautiful southern Wisconsin farm country. Students will capture the abstract essence of this beautiful layered landscape with paint and paper. This painterly collage workshop will lead you in interesting new directions with abstract ideas and fascinating techniques. Don't miss it! 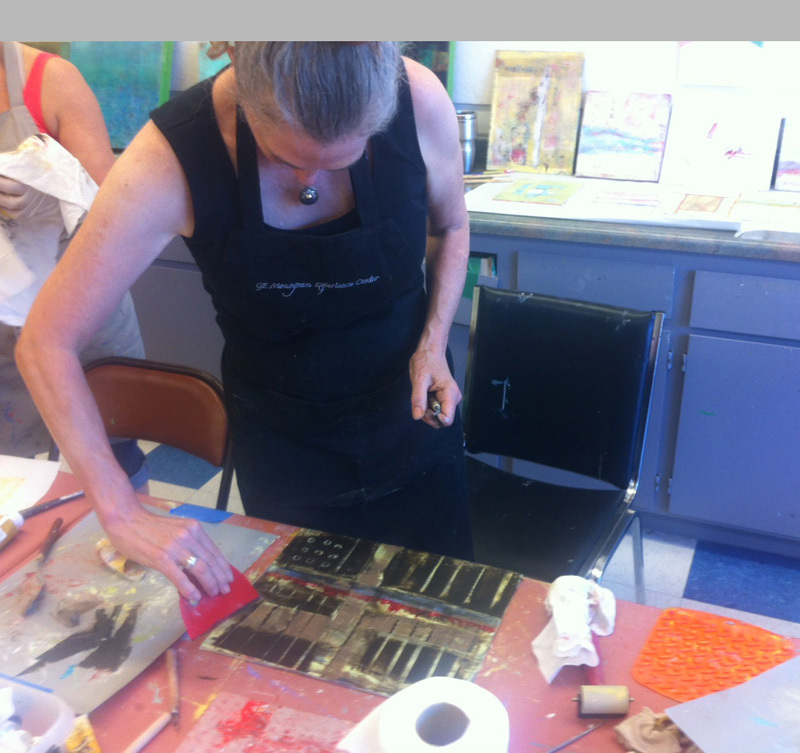 Options for using oil pigment sticks over a collaged base will be discussed. This is our annual summer retreat/workshop in Mendocino--a place to relax and enjoy art making with other artists as well as to explore the beautiful Mendocino Headlands. This year our abstractions will look to the landscape and archtecture of the area for inspiration. For four memorable days work with innovative techniques and ideas in oil based mixed media. Materials include pigment sticks and oil paint, enhanced with cold wax, Galkyds and Gamsol, as well as texturing additives—including marble dust and sand. From thick to thin, opaque to transparent, smooth to textured, drawing to painting, we’ll explore the excitement of mixed media oil painting.